Map of varieties commercialized by MAIZE CRP partners in 2017, with special traits listed per variety. 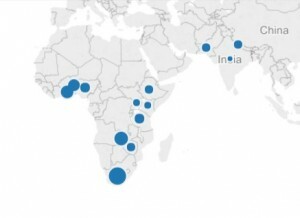 Map of varieties commercialized by MAIZE CRP partners in 2016, with special traits listed per variety. Only available information is depicted. 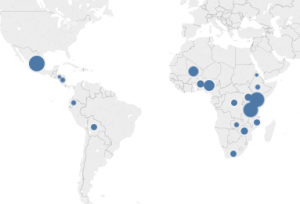 Map showing MAIZE CRP training activities in 2015, with breakdown by training type, program and gender balance. 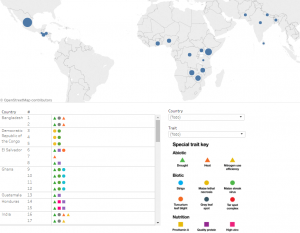 Map of varieties commercialized by MAIZE CRP partners in 2015, with special traits listed per variety. Only available information is depicted. 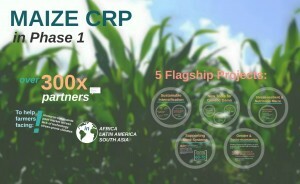 What did MAIZE CRP achieve in Phase I (2012-2015)? Find out in this infographic. 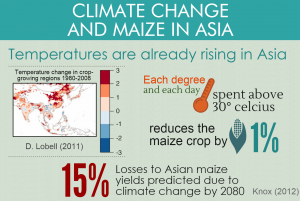 What are the main challenges posed by climate change to maize production in Asia? And what can be done? 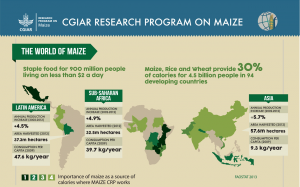 Who are MAIZE CRP partners? What is MAIZE’s gender approach? 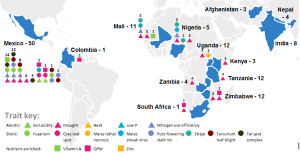 And how is MAIZE planning to reduce post-harvest losses? Learn more about MAIZE CRP functioning in one glance.